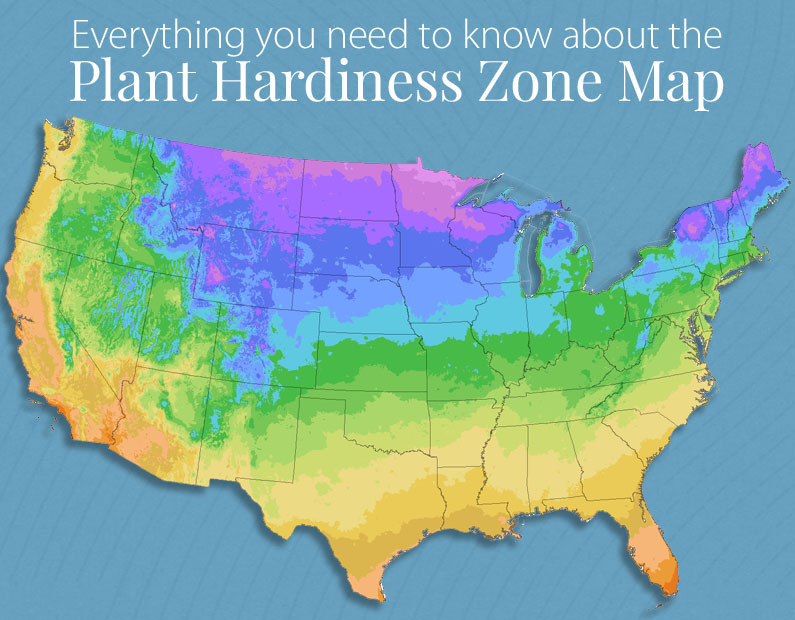 Why Is Your Hardiness Zone Important? Remember, plants are different! Some can survive in cold climates, and some cannot. Almost all plants have been assigned a hardiness zone, and the Zone Map is a guide to determine what plants you can grow in your garden based on the average of lowest temperatures in your area. Before you purchase a plant, KNOW YOUR ZONE! This map is one of the essential tools for gardeners; you need to know whether a particular plant will be able to thrive and survive in your area. Weather Is Not The Same Thing As Climate! The Zone Map is only concerned with the average of the lowest temperatures. When we talk about climate, or climate change, we are talking about high and lows in a particular area. Your garden, your plants, are affected by weather. They really don’t live long enough to ‘experience climate’ ~ trees are affected by climate, herbs are affected by weather! The Zone Map is essential tool for gardeners, but it is not an ‘insurance policy’. Too much rain, too little rain, humidity, wind and unusual weather patterns that cannot be predicted ~ all factors that can affect your growing. Remember, temperatures CAN and WILL dip under what is stated on the map. It’s what gives us topics of conversations in the spring: ‘can you believe we got down to ….. last winter’! Don’t ignore the many other factors affecting your gardening: soil conditions, too much or too little water, pests and disease. A Zone Map helps you get started on the right foot, but the rest is up to you! And of course, we have microclimates; areas where the climate differs from ‘the norm’ due to topographical differences ~ a hilltop, a valley, a slope, a body of water. In your own garden, you may have wind-sheltered pockets on the south side of your brick house where you can grow a plant that is not supposed to grow in your zone. That brick wall is absorbing heat basically making that area considerably warmer than the specified zone for your zip code. In order to really understand these variations, you need to get to know your own growing areas. I really liked this article. It kinda reiterated some of what experience has taught me and gave me new info . This sounds like exactly what I need. In winter it can be 80 degrees one day and the next we can have ice storms and/or snow. So where do we put in our zip code? Click on the blue “KNOW YOUR ZONE”. -Remember, this was an article, so the little zip box will be found at the link he I’m bedded (that blue -). I hope everyone is following the updated chart. I’ve been pointing out for years that my area should be moved up one, and it has been. Hi Mary, we’ve also updated the page with a button to our Zone Finder page at the end of the post. Thanks for all you do to educate a new gardener like myself. That is excellent advice. I learned so much from my local mom-n-pop nursery about our particular gardening quirks when I first moved here; not only about our weather, but what grows best in our soil versus container planting, and when to begin winterizing/springerizing (lol). I also looked at all my new neighbor’s yards, and made friends with the “good yards” first! Happy growing everyone! This is really helpful. I find it difficult (and maybe it is not important) to find seeds for my zone. I feel like since the growing season is so short where I live, that finding seed that either matures faster or is more tolerant is important. If you have suggestions, I would LOVE them. I live in zone 4 but I have heard 3b as well. Always helpful to be reminded of this information! Always enjoy the great info! Thx! So, the USDA ranking has us in zone 6A, where the Arbor Day one has us as 7. Which one is it? Often there will be a ‘hole’ in the weather map that shows our area will not get the rain/snow/hail, etc. I’ve speculated that the bend in the Platte River is the cause, or the proximity to the edge of the flood plain where the elevation rises dramatically. I can’t figure it out, but often the bad weather goes north and south of our community. Any thoughts as to why this occurs? I love my herb plants from the Growers Exchange. This year I am especially looking forward to planting the Green and Purple Shisho plants. Can’t wait to get my Zone 9 plants in the ground. Thank you for your plants descriptions . I like planning what herbs I can use while cooking and I enjoy anticipating what flavors I will enjoy.